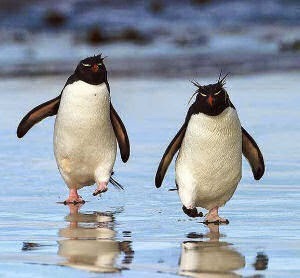 A man is walking along the road, followed by two penguins. A policemen stops him and asks, "Where did you get those penguins?" "They've been following me all day," replied the man. "Well, they're endangered," said the policeman. "You should take them to the zoo." The man agrees and carries on walking. The next day the policeman sees the same man still being followed by the two penguins. "I thought I told you to take those penguins to the zoo?" "I did," replied the man. "They loved it. Now we're off to the beach."